On November 10, 2012 over 500 independent toy retailers around the country are uniting to celebrate Neighborhood Toy Store Day. Becky & Me Toys in Glenview and Evanston will once again participate in the event that spotlights the expert advice and service families have come to expect from the stores and its employees. There will be activities, demonstrations, and giveaways throughout the day. Neighborhood Toy Store Day, held on the second Saturday of November, reminds consumers of the importance of independent toy stores and the value of shopping within their local community. Shopping at neighborhood and independent retailers increases consumer choice and it preserves jobs and local character. According to the 3/50 Project, for every $100 spent in local, independently-owned stores, $68 returns to the community in the form of taxes, salaries, charitable contributions, children’s educational programs and more, in contrast with only $43 dollars when consumers spend their money at a national chain. When consumers buy online, nothing returns to the community. 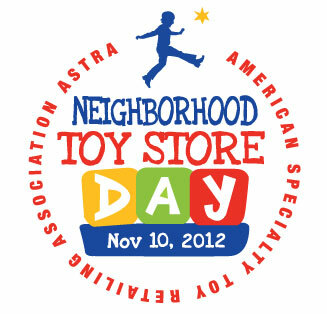 ASTRA (American Specialty Toy Retailing Association) retailers will highlight toys from ASTRA’s 2012 Best Toys for Kids Award list during the Neighborhood Toy Store Day event. This list honors toys that deliver exceptional value and expand a child’s imagination and creativity. The toys were chosen by hundreds of retail experts in the specialty toy industry. Halloween – What is a “Boo Gram”? A Boo-Gram is a mysterious note, left on neighbor’s doors in the middle of the day. The note is usually a poem of sorts, and a large “Boo!” decoration for their front door. The decoration serves as a means of communicating to other neighbors that this house has already been “hit”. By Halloween, it is not uncommon to see Boo-Grams lining up and down the street on all the doors in some neighborhoods! Accompanying the Boo-Gram is a collection of goodies, determined by the giver. The goodies may vary from small Halloween treats, to kid’s toys. The magic of these Boo-Grams is the reciprocation of this gift, as it is expected that when you are “Boo’d”, you must “Boo” 2 other neighbors as well (after all, if you don’t like your “Boo” gift, you can always re-gift to another neighbor!). Adventurous types “Boo” their neighbors in the broad daylight or early evening hours, as it increases the possibility of getting caught… those familiar with the famous “doorbell ditch” prank of their childhood years will be happy to know that this tradition lives on, though the recipient gets a fun gift in the process. Many neighborhoods start in early October, however the common time to start seeing “Boo-Grams” is a couple of weeks before Halloween. However don’t wait for someone to “Boo” you – start the tradition in your neighborhood… you’ll be surprised how quickly the excitement spreads around the neighborhood! Posted in Uncategorized. Comments Off on Halloween – What is a “Boo Gram”? Often parents tell us that they want a game that their child can play alone or that two children can play without parent involvement. However, most games are meant as interactive venues through which children and adults can learn together. An incredible amount of learning happens when children are playing. They learn to reason, negotiate and problem solve. They develop large and small motor skills. They broaden their language skills and vocabulary. They learn to take risks and develop confidence and competence. By playing games, children can learn to take turns, pay attention to others, be considerate, follow the rules, predict outcomes, determine consequences, think critically, get along socially with others and use their imaginations. These skills are useful to them for success in the classroom. Children love playing games. We see it here every day. They love it even more when it means spending time with their parents. Playing games promotes personal interaction and helps create opportunities for open communication. While you play together, your children may start conversations they may not have felt comfortable with otherwise. Plus, turn-based games introduce and encourage social skills and help children (and adults) learn to win and lose gracefully. Good communication during a child’s early years builds confidence, accelerates learning, and promotes a positive influence that extends through adolescence and beyond. So go get out a great game and PLAY!